President Rodrigo Duterte warned the top two leading telecommunication companies to stop with their alleged derailing of a third telecommunications carrier or he will be forced to put them under government audit. Duterte stated that the lawsuits don’t scare him and that the Bureau of Internal revenue may come soon to audit the leading telcos during the first year of their business. 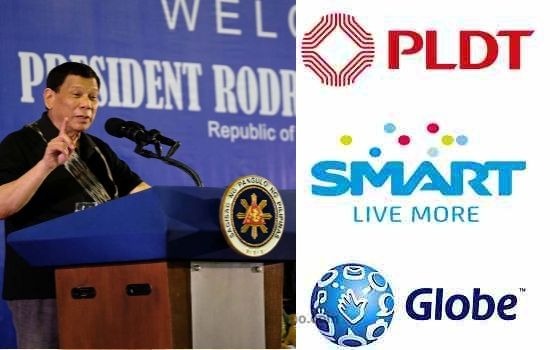 Presidential Spokesman Harry Roque mentioned that the proposal for the government to buy back some radio frequencies which were held by the telcos was rejected. Such demands displeased the President since the all frequencies are owned by the state and were given for free in the first place. “And the President last night was emphatic since we gave these frequencies for free, he will not allow the holders to benefit from a free privilege by charging us anything to enable the third telecoms carrier to operate,” said the spokesman.